Join us for a special Convocation event during the month of Genocide Commemorations for the Armenian, Jewish, Cambodian, and Rwandan communities. This event will feature keynote speaker Dr. Yael Danieli, an internationally renowned therapist whose work with Holocaust survivors broke through the "conspiracy of silence" that defined the lack of consideration given to the trauma resulting from mass murder as well as physical and cultural genocides. Dr. Danieli is the point person for the United Nations on these issues and has worked with Holocaust survivors, genocide survivors in Rwanda, Truth and Reconciliation tribunals in South Africa, and Bosnian victims of genocide. A panel discussion will follow Dr. Yael Danieli's speech. The panel will include members of those communities who have undergone genocide in the twentieth and twenty-first centuries. We will hear from the Native American and African American genocides; German Southwest Africa/Namibian genocide (1904-1907); Armenian genocide (1915-1923); Holocaust (1941-1945); Cambodian genocide (1975-1979); Rwandan genocide (1994); Darfur genocide (early 21st century) and the Kurdish cultural genocide that continues to this day. Sponsored by: The Law Offices of Joe Bornstein, Marcus/Clegg LLC, Portland Harbor Hotel, Holocaust and Human Rights Center of Maine, Jewish Community Alliance, Armenian Cultural Association of Maine, Rwanda Community Association of Maine, USM Model United Nations, and NAACP Maine. Keynote Bio: Yael Danieli, Ph.D.
Dr. Yael Danieli is a clinical psychologist in private practice, a victimologist, traumatologist, and the Director of the Group Project for Holocaust Survivors and their Children, which she co-founded in 1975 in the New York City area – the first such program in the world. She has done extensive psychotherapeutic work with survivors and children of survivors on individual, family, group and community bases. She has studied in depth post-war responses and attitudes toward them, and the impact these and the Holocaust had on their lives. Most recently, she has created the Danieli Inventory for Multigenerational Legacies of Trauma that allows scientifically valid assessment and comparative international study of the phenomena and founded the International Center for the Study, Prevention and Treatment of Multigenerational Legacies of Trauma. 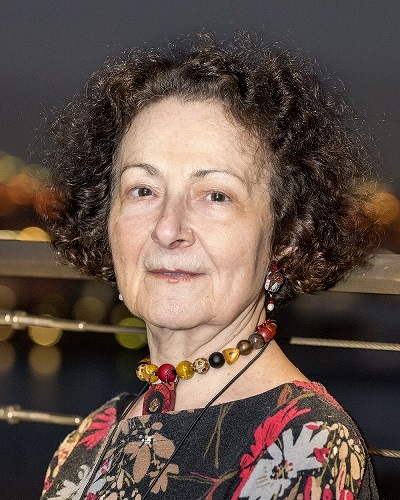 She has lectured and published worldwide in numerous books and journals, translated into at least 20 languages on post-trauma adaptation, optimal care and training for working with this and other victim/survivor populations, and received several awards for her work, the most recent of which are the Lifetime Achievement Award of the International Society for Traumatic Stress Studies (ISTSS) in 2002 and the Award for Lifetime Achievement in Trauma Psychology of the American Psychological Association Division 56-Trauma Psychology in 2012. In 2008 she was appointed Advisor on Victims of Terrorism for the office of the Secretary-General of the United Nations, and helped organize the first Symposium on Supporting Victims of Terrorism at the UN. And as (now Emerita) Distinguished Professor of International Psychology at the Chicago School of Professional Psychology she helped build the first Ph.D. program in international psychology. She has served as consultant/expert to the ICTY and the International Criminal Court on issues related to victims and staff care, consultant to South Africa’s Truth and Reconciliation Commission and the Rwanda government on reparations for victims, and has led ongoing projects in Bosnia and Herzegovina (Promoting a Dialogue: “Democracy Cannot Be Built with the Hands of Broken Souls”), and lectured/taught/trained in Northern Ireland. A Founding Director of the ISTSS, Dr. Danieli was its (1988-1989) President. The Report of her commissioned Presidential Task Force on Curriculum, Education, and Training for professionals working with victim/survivors was adopted by the United Nations (E/AC.57/1990/NGO.3). She also co-chaired the ISTSS Task Force on International Trauma Training. Dr. Danieli has been the Senior Representative to the United Nations of the World Federation for Mental Health (WFMH), the ISTSS, and the International Organization for Victims Assistance, serving also as Vice Chair of the Executive Committee of Non-Governmental Organizations Associated with the UN Department of Public Information and Chair of its Publications Committee. A Founding Member of WFMH’s Scientific Committee on the Mental Health Needs of Victims, and its Chair, she has been active in developing, promoting, adapting and implementing the United Nations Declaration of Basic Principles of Justice for Victims of Crime and Abuse of Power (A/RES/40/34) and all subsequent UN victims-related work, including their right to reparation (E/CN.4/Sub.2/1996/17), the Statute and Rules regarding the victims’ central role in the International Criminal Court, including initiating, help creating, and continually supporting its Trust Fund for Victims, and victims’ support and care as related to terrorism. As well, she has elaborated and promoted reparative justice as a unifying framework for victims’ rights’ and optimal care, from both the outcome and the process points of view. She has served as Consultant to the UN Crime Prevention and Criminal Justice Branch, on the Board of its International Scientific and Professional Advisory Council and as Chair of the Executive Board of the Alliance of NGOs on Crime Prevention and Criminal Justice; also, consultant to the World Health Organization, UNICEF, the Office of the UN High Commissioner for Human Rights and various governments on trauma and victim/survivor’s rights and optimal care. In the US, she has consulted for the National Institute of Mental Health, the Federal Bureau of Investigation and, among other news organizations, Associated Press, BBC, Reuters and CNN.